Goodbye Possums! 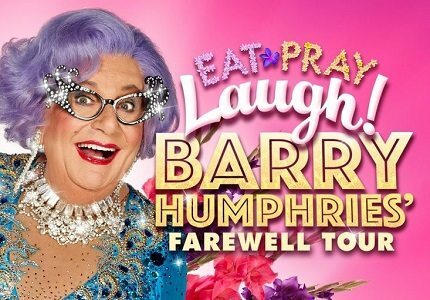 Barry Humphries, the man behind the dame, embarks upon a last hurrah before he takes his final bow! His creations include the lady herself, Dame Edna Everage and the exuberant cultural attaché, Sir Les Patterson, bows out with style in Eat Pray Laugh! Eat Pray Laugh! Will give audiences around the country on last glittering chance to see Barry Humphries – one of the world’s sharpest wits and finest comic talents, and a starlet of stage and TV over the last 50 years. Of course the show will also allow the maestro to thank his many fans. Surrounded by spectacular sets and gorgeous and talented dancers, Dame Edna promises to ‘empower’ her audiences with what she describes as ‘a meditation on loss, gender, climate change, gay marriage and ethnicity’. “So, Possums, please do come and say goodbye to me. It would be lovely to see your faces for the last time,” Dame Edna says. The show is not suitable for children under the age of 16.